Whether you are planning new storage racks or bringing old ones up to current requirements, you’ll be dollars ahead when you get the assistance of the Shelf Master team. Nashville Wire decking is custom designed to meet the requirements of not only load capacity, but also for the type of product that will be stored on the decking. 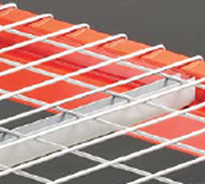 Wire Mesh Deck also known as wire decking is a versatile product that can be effectively used in many applications. 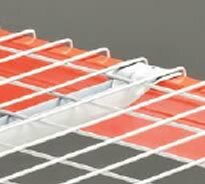 Wire Mesh Deck can be cut to size, are economical and lightweight. 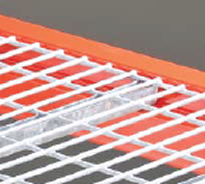 Wire Mesh decking is versatile because it adds a clean and uniform grid pattern appearance. Wire mesh decking can be used as an alternative to particle board, plywood, and other wood supports. 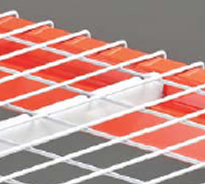 Shelf Master stocks various sizes of wire mesh decks in our warehouse and its ready to ship nationwide. Designed with standard support channels to accomodate standard 1 1/2″ or 1 5/8″ step beams. design with flare support channels to accomodate box and structural type beams. 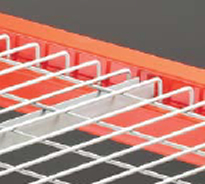 Designed for hand stacked loads and order picking; ﬁts inside load beams. 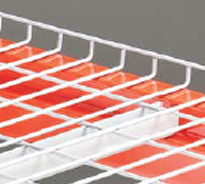 Decking with the support channels inverted for food storage and other clean applications. Built in backstop to prevent product from being pushed too far. Inside waterfall leaves beam face unobstructed for labels and barcodes.